Marines who enter the Military Police Occupational Specialty (MOS 5811) will become capable law enforcement officers with jurisdiction on and immediately around the military installation. Responsible for the security, safety, and daily admission onto the base, the Military Police will be standing guard at the gate, patrolling in vehicles and on foot, monitoring the security of sensitive areas, and answering calls for his or her military members on the base or base housing. In Fort Leonardwood, Missouri at the USMC Detachment, Marine Corps students are taught the skills necessary to function in the Operating Force and Supporting Establishment during peacetime and time of conflict. The students will receive instruction and practical application in the following areas related to the missions of the Military Police: Law Enforcement Operations, Law and Order Operations, Detainee/Corrections Operations, Law Enforcement Support to Mission Assurance Operations. Job Description: Military police perform assigned military law enforcement duties to uphold the criminal justice system, maintain good order and discipline, and support the commander's law enforcement and security requirements in peacetime and combat operations. Typical duties include foot and motorized patrol, control of pedestrian and vehicular traffic, flight line security, crime prevention/physical security, desk sergeant, communications dispatcher, squad leader, operations sergeant, platoon sergeant, and provost sergeant billets. MOS 5811 is very demanding in that the military police are confronted with every form of violation and criminal liability, misdemeanor through felony. As a military police officer, you are a Marine who has to at times uphold the laws and rules of the military with fellow Marines. The Eleven General Orders of a Sentry is a good place to start if you are considering the Military Police option as a MOS after boot camp. Must possess a GT score of 100 or higher (not waivable). (a) Active duty Marines must complete the Law Enforcement Military Police (MP) Course at the United States Army Military Police School (USAMPS) at The Marine Corps Detachment - Fort Leonardwood, Missouri. (b) Prior service Reserve Marines, non-MOS qualified, may be certified for MOS 5811 also by attending the MP Course, or if unable to attend the regular MP Course, they may be certified as an AMOS-only, by the unit commander upon successful completion of the Alternate Training Instructional Program (ATIP) of Marine Force Reserves. The ATIP for MOS 5811 consists of all of the following: serving 6 months in a Reserve MP billet; successful completion of Military Police Course (Reserve), Phase I and II of the Army School System (TASS), demonstrated proficiency of Individual Training Standards (core tasks for MOS 5811) as outlined in Marine Corps Order 1510.86C; and favorable endorsement by an MP Inspector-Instructor. As described in COMMARFORRES Order 1535.1, some core tasks, which are not acquired at the TASS course, can be accomplished/demonstrated through Managed On-Job-Training (MOJT). Must be eligible for a secret security clearance. Must have normal color vision (not waivable). Must be 19 years old prior to completion of formal school (not waivable). Must have a minimum height of 65 inches with weight in proportion (waivable to 62 inches). Must have valid state driver's license (not waivable). Must have vision correctable to 20/20. Must possess clarity of speech. Must have no history of mental, nervous, or emotional disorders (not waivable). No convictions by special or general courts-martial or civil courts (except minor traffic violations); no nonjudicial punishment convictions involving illegal drugs, spouse abuse/domestic violence, or immoral character (not waivable). 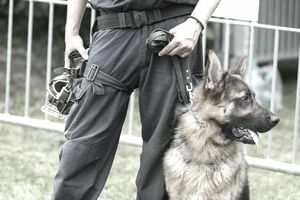 Military Police Dog Handler, 5812. Do You Have What It Takes to Be a Marine Corps Criminal Investigator?